Fish lovers will no doubt love this food. One tin of Mackerel & Sardine contains 50% mackerel and 25% sardines. This food is also naturally rich in taurine. Available in tins of 70 and 156 grams. 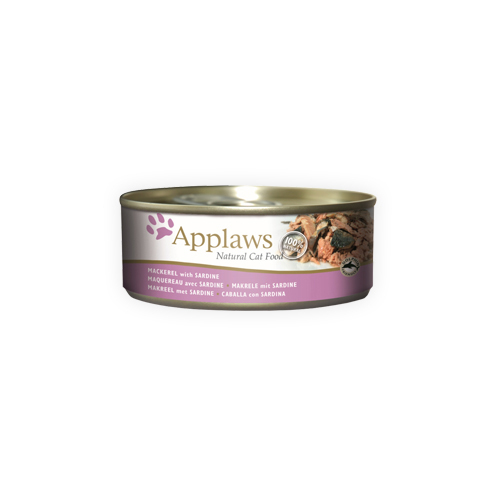 This Applaws wet food allows you to serve your cat a tasty meal packed with fish. One serving of Mackerel & Sardine contains 50% mackerel and 25% sardines. The other ingredients are broth and rice. Everything is 100% natural. The food also contains taurine. This ingredient supports the heart and the eyes. Applaws Cat Mackerel & Sardine is available in tins of 70 and 156 grams. Mackerel (50%), sardine (25%), fish broth (21%) and rice (4%). Have you used Applaws Cat Food - Mackerel & Sardine before? Let us know what you think about this product.